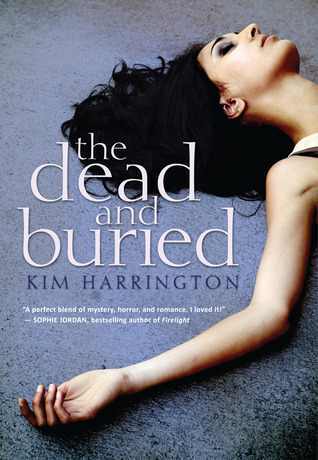 Review: I love a good ghost story especially one that is paired up with a murder mystery so of course I had to get my hands on The Dead and Buried. I don't usually talk about the cover of books much but I'm not a fan of this one, and I probably wouldn't have even cared but I remember seeing the original cover that was planned for this book and it was so much better and actually went with the story. ( I have the original posted below ). The story is about a girl named Jade moving to a bigger town during her senior year of high school with her half brother, dad and step mom. She comes to find out her brother can see a girl that glimmers. 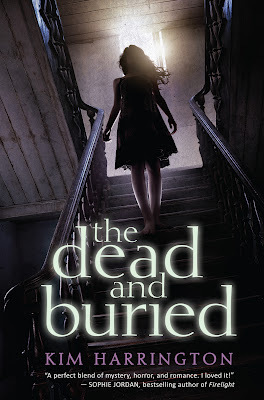 The house they have moved into is apparently haunted by a girl (who just happened to be the most popular girl in school) who went to her school and was just recently murdered in that exact home. Now the ghost of the girl is forcing Jade to find out who killed her and threatening to do harm to her five year old brother if she doesn't. The only character besides I'd say the ghost who was really fleshed out was Jade and I really did like her. She had a hobby of collecting stones and she knew what each stone meant and it's healing properties and she was her own individual she didn't care about what someones social status was. I also liked how protective and loving she was towards her half brother regardless of her rocky relationship with her step mom. Now as far as the haunting goes, it was pretty cliched there was the temperature changes, Ouija board being used, and possession. I can't say I was creeped out by the book but there was the part of the possession that did get a little under my skin and that was mainly because it involved a little kid and for some reason anything involving kids and ghosts creep me out. As for the ghost - Kayla Sloane, well she was vicious. She was a mean and hateful yet somehow very popular girl alive and her horrible personality transferred over into the afterlife. The mystery behind the murder is what really had me turning the pages. There was a cryptic diary left by Kayla in which we got to learn more about her and really learn about all the people that could have had a motive to kill her. Also Harrington did a good job with keeping the mystery around who the killer could be. I had kind of guessed who it was but didn't really find out until the end along with the main character. Overall the book had a good flow to it and it was a quick read. It wasn't dark or super creepy but had a good murder mystery that kept my attention.